Not one who enjoys staying grounded for long, I jetted off to Muscat, Oman this past weekend. Partly to celebrate to celebrate the 3-year anniversary with my boyfriend, and partly for a much-needed change of scenery. I had been to Muscat once before, almost 3 years ago, and absolutely adored the old Arabic city book-ended by the stark Hajjar Mountains and the lovely Indian Ocean. I’d been looking to go back ever since. Unfortunately, during this trip I did not actually get to see much of the city; the obscene heat this time of year just doesn’t allow for outdoor activities. I did, however get to stay at The Chedi, a resort I’d been basically obsessing over staying at ever since I stopped there for a quick cocktail during my previous visit to Muscat. I’ve definitely been in 5-star hotels that, while nice, did not really impress; The Chedi Muscat was not one of these. The entire experience was enormously pleasurable and not one aspect of the hotel or the service there was anything less than 5-star incredible. True, you’re going to pay for those services, but in my opinion, it was money well-spent. Most notably, the food was a costly addition. 10.5 rials (~ 28 USD) for the hamburger ordered from the poolside lunch menu, but seriously, that hamburger, which my boyfriend claimed was the best he had ever eaten, was ridiculously delectable – as was any other food or cocktail had on the Chedi grounds. Even the gift shop was considerably better than the norm and, not having bought a new bathing suit since I first moved to Dubai, I was presented with a large selection of colorful options from La Perla. 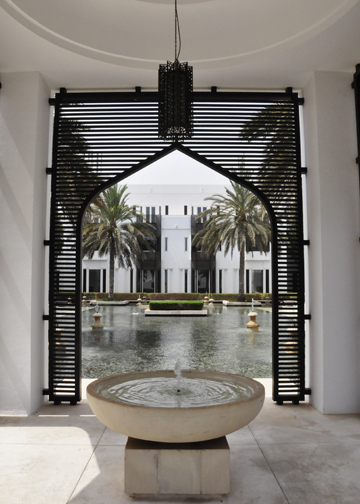 We arrived at The Chedi quite early; a 6.40am flight out of Dubai had us at the Chedi at 9am. Remarkably, they were able to check us into our room immediately (although it’s worth noting that the summer is the low season in the Gulf)! Additionally, I requested a late check out for the next day (our flight departed at 9pm) and they offered a 6pm check-out time. Very much appreciated, especially when I figured offering a 2 or 3pm check-out would be generous. 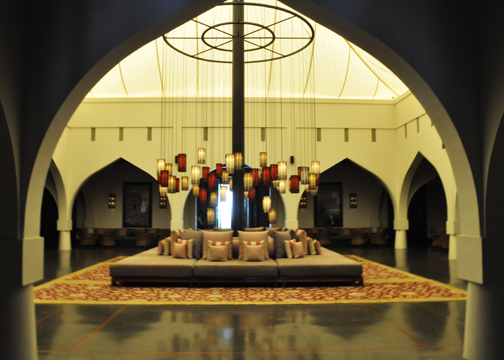 Upon check-in, we decided to upgrade to a Chedi Deluxe Club room. The complimentary minibar (yes, please), pre-dinner cocktails and canapes and airport transfer in a hotel car, not to mention the better room, seemed worth the added fee. 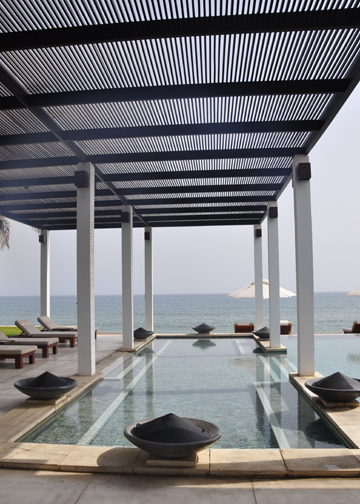 Without question, my favorite bit of the Chedi and its gorgeous grounds was the beach-side Chedi pool, which was open to adults only. Not having to tolerate children screaming and splashing around in the pool was such a treat. Nothing ruins a relaxing day at the pool more or faster than the appearance of children. 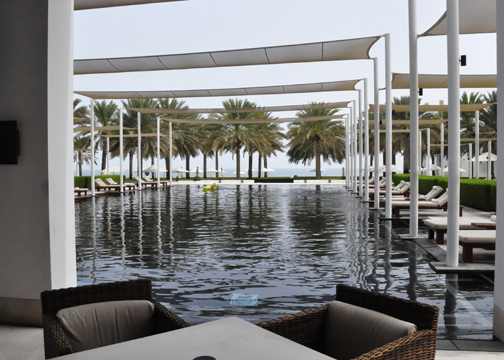 The Chedi also had a second pool, the Serai pool, which was open to children. 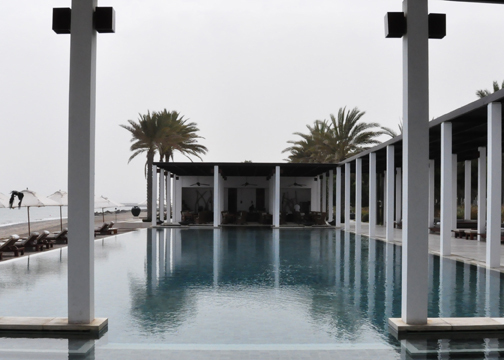 Both were really lovely, but I spent all of my time relaxing on the massive lounges at the Chedi pool, broken up with dips in the (really) chilled pool and the ocean, which was literally bath-water warm. Lazy holidays are really, really not my thing. I can tolerate doing nothing but lazing for a few days, maximum, but then I will quickly become bored and agitated. For just a weekend though, I found The Chedi to be a choice destination to partake in absolutely nothing.